Harpers Ferry, which was the KLYAM go-to spot to see Jay Reatard, closed on Halloween. It will be re-opening sometime in January as Brighton Music Hall (the nomenclature is a reference to the street in Allston Rock City that it is located on). The capacity will stay the same (340 people), but there will be some internal overhauls such as a new sound system, painting, and bathroom renovations. Dum Dum Girls have already been booked to play there on March 2. The venue will serve as a “development” stage for lesser known bands to play on before moving up to the newly renovated Paradise Rock Club — a much larger and renowned venue located just down the street. That said, it is no coincidence that the owners of the Paradise are the executive partners for the Brighton Music Hall. Moreover, the Paradise, Orpheum Theatre, and the House of Blues are all operated by Boston Opera House Ventures LLC. The effect that the opening of Brighton Music Hall will have on local “competitors” remains to be seen. Great Scott, a favorite little venue of ours as well, is an independent club that is a little smaller than Brighton Music Hall, but has put on plenty of now quite popular bands such as Editors and MGMT. Great Scott does have some ties to the booking agent of the ‘Dise and House of Blues, so they aren’t too worried. The Middle East might see some increasing business from Leeds Entertainment, a hip-hop booking group which puts on some shows there, but that had a very close relationship with Harpers Ferry. Other than that, though, the new Brighton Music Hall might sucker some bands that would potentially play Middle East away from there and into the Boston Opera House progression. I’m not really sure how this side of the music business operates, but it only seems to make sense that a local conglomerate of sorts like Boston Opera House LLC would have some more purchasing power (or bringing in power) than independent clubs like the Middle East and TT The Bears, etc. It certainly is a little weird to think about this when, after all, we are talking about a predominately independent music scene. Never heard before opinions on pick-up lines, hangover cures, lactating, and stock placement at Best Buy! In yet another strange pop culture twist, The Rifles (a favorite of mine) are currently being featured in an iPod commercial. Not directly, of course. The listener of the iPod in the commercial clicks on The Great Escape at the very end. The album art is very visible. This is yet another strange pop culture twist because The Rifles were being played on satellite pop radio throughout summer 2010. I found that weird because nobody knows about the Rifles in the United States…or so it seems. More exposure can’t hurt. 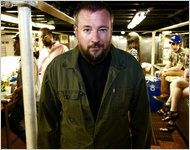 SHANE SMITH, a founder of Vice, the streetwise, testosterone-fueled culture and fashion magazine, still chugs canned American beer. He still listens to Bad Brains. And he still favors tattered Vans skateboard shoes and black T-shirts. That much is the same. Shane Smith, one of the founders of Vice magazine, on the Rocks Off concert boat with members of the band The Black Lips. It is everything else that has changed. Since signing to Vice Records in 2006, the Black Lips have found a little more of everything: exposure, music videos, and world travel. Also included: a sponsorship from Vestal Watch. Ian seems to be the main guy in the band showing off Vestal on his midget bike. Q. Last question, what’s your favorite rock record? Chomsky. (Mumbles) You’ve got me on that one.